A little rain never hurt anyone. But when that light drizzle turns into a windstorm, going outside without getting wet might seem like an impossible task. Running to your car while it’s blowing a gale even under an umbrella is not the most pleasant experience in the world. We’ve all been there – we don’t want to wait out the storm, so we go out only to have our flimsy umbrella flip inside out every time there is another gust of wind. Is there really a way out of this constant battle with the rain? Invest in a windproof umbrella and your days of struggling with the canopy flipping inside out are over. So where do you start when looking for a windproof umbrella? Ribs are one of the most important parts of a reliable umbrella. If you are looking for rain gear that guarantees protection from the wind look for fiberglass ribs. This is the latest material in the umbrella business that all the experts are using. What’s special about fiberglass? It’s rust-free and lightweight, which makes it perfect for taking on your travels. It’s also flexible, which means your umbrella won’t break with the first gust of wind. The frame of La Bella Umbrellas are all made of fiberglass, making your favourite rain gear secure and reliable. If you are looking for something truly dependable and sturdy go with the classic stick umbrella that has a solid shaft made of – you guessed it – fiberglass! The 300 thread-count Pongee fabric of La Bella Umbrella will not let the wind get to you. Don’t opt in for the cheap nylon variety umbrellas that are not entirely waterproof and will consequently get you soaked. The heavy-duty stitching is another way La Bella Umbrellas are made to weather the storm. Forget about one of the ribs tearing off and making a hole in the beautifully crafted canopy. Don’t forget to check the diameter that is best suited for you. The reliable stick umbrella comes with a cover size of 52″, which is great when there are heavy rains or when you want to share your umbrella with a friend, family member, or someone special. You don’t want the wind to tear out the umbrella right from your hand; that’s why La Bella Umbrella offers a non-slip rubber coated handle that provides an excellent grip. Its non-stick material will not leave unwanted marks on your hands, and will stay in the best shape for years to come. Plus, the umbrella is also constructed with a durable wrist strap that provides an additional level of security. With all of these features your umbrella will not be flying out of your hand any time soon. Even though the look of the umbrella might have stayed the same over the years, the technology that goes into making these reliable rain accessories never stops evolving. 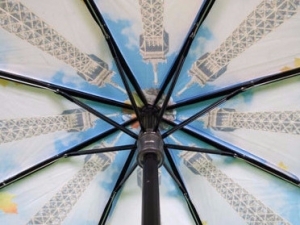 La Bella Umbrella employs the latest developments in the umbrella industry to produce rain gear that is proudly Canadian and that hits the mark every time, keeping you dry in style.